California dairy farms play a key role in the state’s economy and food system. About 190,000 in-state jobs depend on dairy farming and processing, according to the most recent research from the University of California Agricultural Issues Center. However, the California dairy community provides not just jobs, but valuable careers with opportunities for advancement. For Juan Castellanos, dairy farming was an unexpected career path. He began working at Phillip Verwey Farms in Hanford when he was 18. He was just looking for a job that could help him pay for college. His father worked on the farm, and he had grown up around dairies. He thought the work would be manual labor, but he wasn’t afraid of hard work. Juan’s first assignment was cleaning watering troughs. Then, he learned to work nearly every job at the dairy by filling in shifts as needed and taking on new tasks and responsibilities. One day, Juan ended up in a conversation with the farm manager, Frank Cardoza. Frank was curious to learn about the college computer science classes Juan had been taking. He realized that Juan could provide some much-needed help in the office—starting with data entry and record keeping. “I told him that I wanted him to help in the office, but that I also wanted him to stay in school,” Frank said. Juan’s responsibilities on the farm continued to grow. Nearly four years later, Juan still enjoys developing new skills and taking on new challenges. 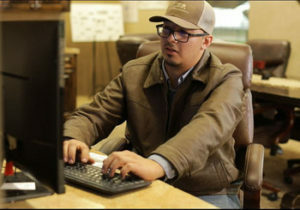 He has also been able to put his passion for motors and computers to work, by assisting with the day-to-day monitoring and maintenance of the farm’s manure digester. He keeps track of the digester’s operation using his phone, home computer, and work computer. When needed, he helps troubleshoot problems and maintains the system’s three-megawatt engine, which produces enough renewable energy to power nearly 3,000 homes. Besides the digester, Phillip Verwey Farms uses many innovative and environmentally-friendly practices. The farm was one the first to implement an electric feed mixing system, which has eliminated the emission of more than 20 tons of nitrogen oxides (NOx) each year by reducing the use of diesel fuel. Juan is proud to know that between the mixer, the digester, and the farm’s energy-efficient equipment, they are making a great difference in improving the Central Valley’s air quality. Juan expects to graduate from West Hills College in two years. However, he has no plans to leave the dairy. He sees even more opportunities for growth both personally and for the farm. Juan, Frank, and another employee, Jose Castrejon are currently implementing the farm’s new cow-monitoring system. Cows are now wearing devices (similar to FitBits) that gather accurate information about a number of health indicators. This saves data-entry time, and allows the team to ensure even better quality animal care. Frank knows from his own experience that dairy farms provide endless opportunities for career growth and further advancement in sustainability. His family immigrated from Brazil in 1973, when he was 4 years old. He began working on a dairy farm at a young age. In addition to his current role as farm manager, Frank provides consulting for other farms. Over the years, he has trained numerous people to manage every aspect of a dairy farm—cow health and comfort, feed and nutrition, human resources, milking, manure management, and more. “Every person matters, and every cow matters,” Frank said, as he pointed to the farm’s flowchart of employee roles and responsibilities. Looking to the future, Frank believes technology will continue to play a larger role on California dairy farms, but it won’t replace the need for hard-working employees who are interested in pursuing a career in the dairy industry. Advancements in technology will continue to provide high-quality jobs and even more opportunities for employees to learn and grow, while continually improving the way dairy farms ensure they provide the best possible animal care and the most responsible management of natural resources. California’s dairy farms provide tremendous value to employees and residents, while serving as world leaders in sustainability.